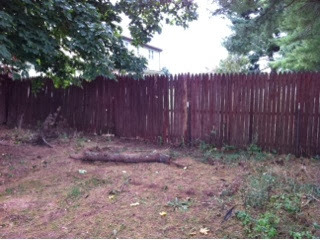 Just after the CSA and market season began, a very large tree branch fell from a tree and broke the fence. No one was injured. The broken part was still an intact fence, no livestock escaped or anything like that. We leave the farm a bit during the growing season. Even if not farm related travels are usually farm related: policy meetings, planning meetings, education, fund raising for outreach groups. Mostly working during the growing season! So the removal and repair has been way down on the list of priorities. Didn't hit either building or anyone, so all is well. But it didn't look so hot. The massive branch was chopped up and hauled away, the pickets themselves realigned and replaced. So now it looks just as it did before: a fence. It was a fair amount of work to have nothing really change. Kind of like getting the laundry done. Except a ton more work.